How do you honor the memory of Holly Lind, a mother, wife and friend who passed away at the age of 33? By bringing hundreds of people together in support of a cause she cared about deeply: Making Headway Foundation. 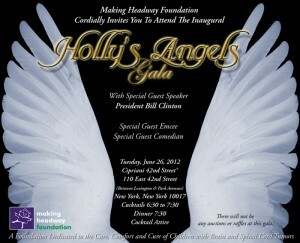 This past summer’s Holly’s Angels Gala was the largest fundraiser in Making Headway history. 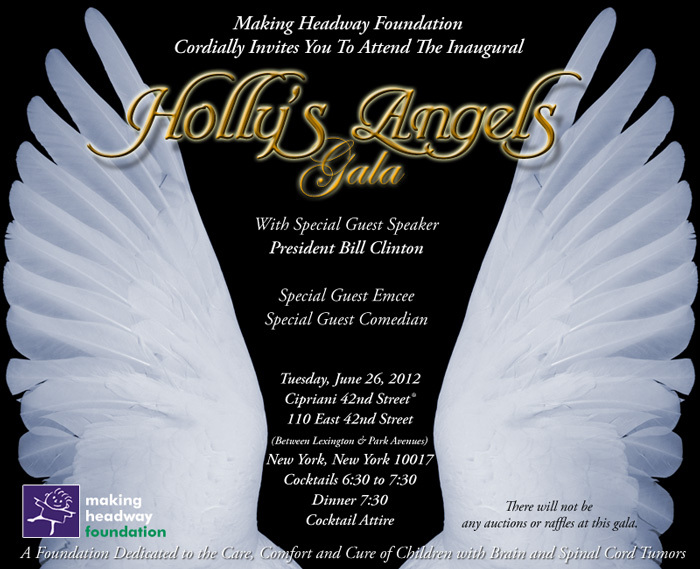 The 750 guests who showed up to honor Holly, her family and the many children she met at the Hassenfeld Children’s Center—the children she dubbed her “angels”—together raised more than $1.5 million. The fundraiser was the result of a joint effort. For a speaker, Making Headway reached out to its longtime friend and supporter, President Bill Clinton, while Holly’s husband, Keith, reached out to friends, acquaintances and business associates for an audience. President Clinton wasted no time in saying he’d be delighted to make an appearance; the hard part was finding a date and location that worked with his busy schedule. Once that was settled, it was just a matter of details. Making Headway supporter, Louis Konstantinos Vellios, of Konstantinos Floral Design, donated his genius for décor to create a custom environment at Cipriani’s 42nd Street location. A special dinner committee worked with the Cipriani staff to add distinctive lighting and choose the perfect menu. An Evening of Memories, Laughter and Inspiration The gala was held on the evening of Tuesday, June 26. Celebrity sportscaster Erin Andrews was the emcee, and comedian Seth Meyers lightened the evening with his gentle brand of humor. Keith Lind spoke movingly about Holly, who had been his high school sweetheart, while Making Headway president, Edward Manley, and medical advisor, Dr. Jeffrey Allen, each took a turn to speak about the Foundation’s work. But not surprisingly, it was President Bill Clinton who brought down the house. President Clinton used his time not just to focus on one of his favorite topics, grassroots philanthropy, but to give his own personal account of knowing the Manleys and express his admiration for Making Headway’s work. After that, it was time for another first, as Keith Lind returned to the stage with an impassioned appeal for participants to donate again right then and there—through their cell phones. The response not only set a record for Making Headway, which has never done text-based fundraising before, but broke the record of Text to Pledge, the company processing the donations. All in all, it was a wonderful night, in which the children who had so inspired Holly Lind became an inspiration for us all.